Auntie is having a birthday today! She has agreed to forgoing a physical gift in exchange for a whole series of Hot People posts. 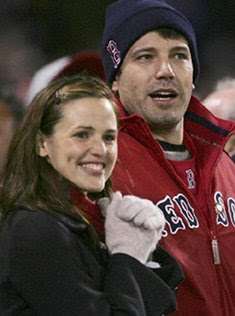 That last one was the only way I could get Jennifer Garner & the Red Sox into one picture. Does the woman never wear a freaking ball cap? Without a specific request I'm totally winging it. I hope you like it, sister-friend! Dude, you rock! Thanks! Who is the last chick? Remember, I don't watch a lot of tv. She has awesome hands though! That's Connie Britton. She became recognizable when she was on Spin City and her character was in love with Michael J. Fox. Right now she's on Friday Night Lights playing the coach's wife/the high school counselor. She's delish, no? Oooh, there's MORE? May I make a request or two? How about Halle Barry and Kate Walsh, with a little Sandra Bullock thrown in for good measure? Aha! I will admit to recognizing Jennifer Garner (with the help of the caption, but I might have managed to put name to face on my own). The others? Unknown to me. I hope I can actually post thia.